National Museum of Emerging Science and Innovation is a “future place” where people can experience the forefront of scientific technology. This museum is located in Odaiba, Tokyo, one of Tokyo’s more popular places, and an astronaut, Dr Mamoru Mohri is working as a director. In addition, a humanoid robot “Asimo” welcomes you and it is employed as “an interpreter” here. 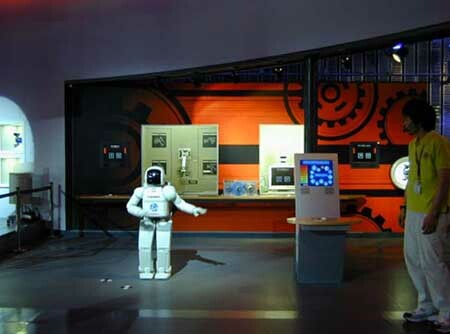 This interactive experience has a wide variety of cutting-edge exhibits. It not only has three floors as permanent exhibitions, but also project exhibitions are regularly held under the theme “network of science”. These exhibitions have received many accolades from around the world. “The TIME! TIME! TIME! – Exploration of TIME!” exhibition is the one I went to and this is also one of those “network of science” exhibitions. When I arrived there, the Asimo show just started and I could see its cute actions. This show is held only once a day on weekdays (twice on a weekend day) so that I was very lucky to see it. Shouting “Hello!” or “It’s hot today!” to elementary school kids to Asimo was good fun. The future, in which we live with robots, might come earlier than we image. I felt an excitement when I was thinking about this. Exploring about “time”, which is an eternal mystery for human beings, from various points of view is the aim of this exhibition. Visitors look around the exhibition as they experience the concepts of time. It is notable that special researchers at The Research Institute for Time Studies in Yamaguchi University = Scientific Navigators, closely examined time scientifically, and 18 powerful creators = Creative Crews all contributed to forge ideas, which are from the Navitators’ view, tangible things. 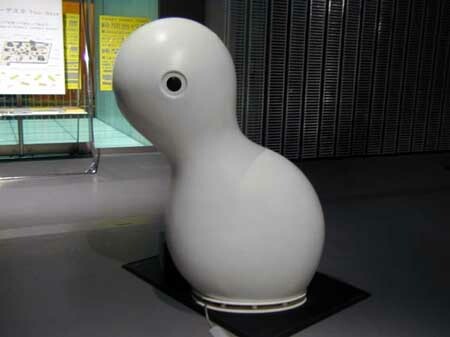 In other words, visitors can enjoy 2 aspects about time in this exhibition. This is a very collaborative exhibition with science and design, and ideas from discussion between Scientific Navigators and Creative Crews have also been added. Time has always been with human beings from “time immemorial” but it is still a very mysterious presence for us. The way of understanding time is different depend on each period or culture, and a unit of time is different between our planet and the universe. (In addition, why do we feel that time flies like an arrow year after year? Is it just my imagination, or what?) Since there are plenty of mysteries about time, I was expecting to find theoretical and scientific explanations. However, as the exhibition overwhelmed my expectations, and the contents were introduced in amusing and fascinating ways. 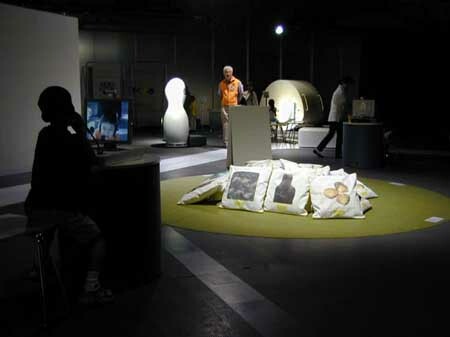 The exhibition consisted of 18 themes and displays. From “the flow of time” to “animal time” and “gravity and time”, topics were really varied. Yellow papers “Souvenir from the museum” were provided in front of each display, and explanations of each theme and recommended book guide for those who want to know more about a topic. This service was from Scientific Navigators and it was a very kind educational support. Moreover, volunteer staff and interpreters gave us detailed explanations as well. So it might be possible to look around the exhibition without opening a guidebook by myself and it was almost like going sightseeing. According to a member of the public relations department, about 2 or 3 thousand people visit the museum and many of them are families and student groups. On the day when I went there, I saw many children enjoying their visit. I could enjoy experiments mixed with hi-tech and low-tech at many sections. Essences of difficult scientific theories were designed in very understandable and interesting ways, and of course, adults could enjoy them as well. The section “Audial Time Illusion” introduced the sensory (the sense of sight, hearing, touch, smell and somatesthesia) causes for a time gap when the brain is deceived by sensory input. I could experience a mysterious illusion that regular flashes of light appear to change in number because of peripheral sound. “Heartbeat Clock” provided us a mysterious space where we could see 2 people’s heartbeats create a beautiful ring of floating light. 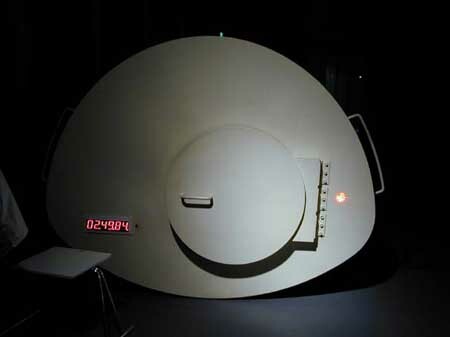 In “Biological Clock: 24-hour DNA”, I could travel the time of biological space. Apart from them, there were several sections I could experience the time of outer space as well. The section “The Complete History of Time” focused the universal time since its beginning 15 billion years ago with the Big Bang and the continuum of time from matter to life to humanity. In “Running to the Theory of Relativity”, I had to run with a watch in order to experience the Theory of Relativity that when we run at high speeds, time slows. Also, I could experience the journey of light by watching at rolling balls in different timing. Complicated theories were simply visualised and some of them made myself a laugh out loud with pleasure. 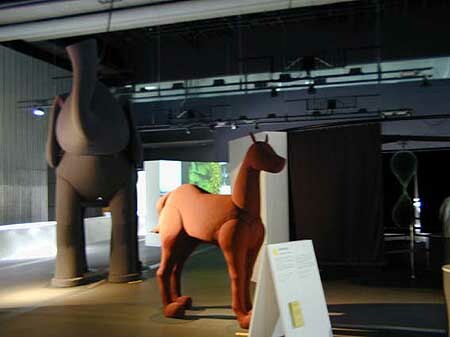 Cloth elephant, horse and mouse were the most popular objects for children. These objects are based on a masterpiece “Elephant’s time, Mouse’s time” and they introduced the theory that each animal has a different time because no animals has the same size of body and heartbeat. Sound and light blink as they follow each animal’s heartbeat. The speed of mouse was quite high but the elephant’s heartbeat made a very slow and low sound. The heartbeat of horse was almost same as human beings’ and these 3 heartbeats made touching trio. In the section “Anechoic Space”, I could experience a length of “3-minute” in an anechoic chamber. So I heard the elephant’s heartbeat, but it is possible to think that it was a good chance to experience a “3-minute” for an elephant. A featureless square bench was my favourite and I could find it at the middle of the exhibition place. However, after a while, I noticed that the bench was moving surprisingly slowly. The bench implied that “Time goes by almost before we realise it”. That was a humorous and cleaver work. Creative Crews: Takeshi Ishiguro, Toshio Iwai, Ryota Kuwakubo, Takuya Shimada, Yasuhiro Suzuki, Kohji Setoh, Haruaki Tanaka, Asao Tokoro + Yoko Ogawa, Ben Nagaoka, tomato interactive, Yoshiaki Nishimura, Kei Fukuda, flow, Musegram, Mintos, Hisato Ogata + Rieko Miyata. TIME! TIME! TIME! – Exploration of TIME! Opening time: 10:00 – 17:00. Sundays to Saturdays. Closed on Tuesdays.